This one is from my agate inspired series - my early mosaic work. A small composition in an agate stone stood out to me, it really lent itself to becoming a mosaic pattern. That became the central element of this mosaic. Once I completed the inner panel, I decided to let the composition spill out onto two additional panels. I thought of this as a collaboration with nature, my addition completed this piece. This was shortly after visiting Arizona for the first time. While working, I thought of that unique southwestern atmosphere created by the bright sun interacting with a landscape very different that of the Northeastern US where I lived at that time. The above mosaic is a larger, unetched version of the "Agate Triptych" below. 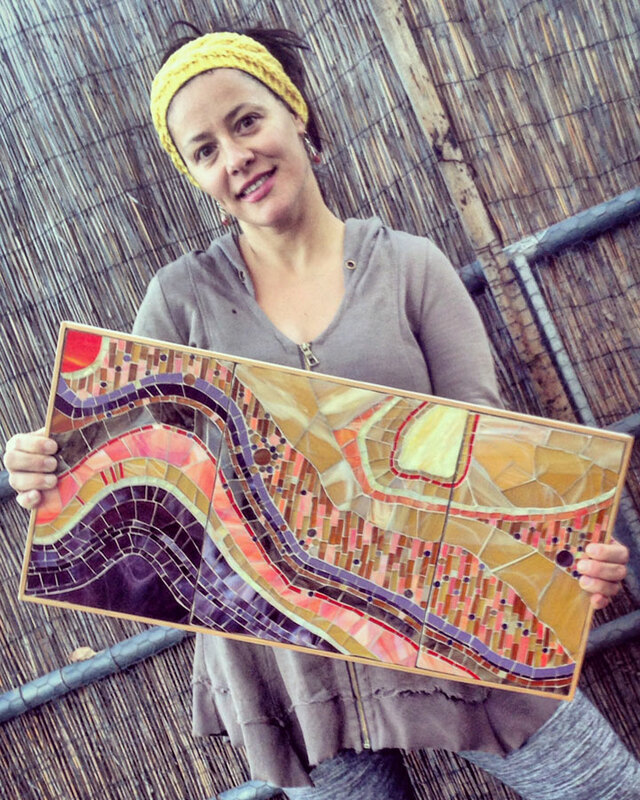 I created this mosaic for a benefit silent auction at "Project Main Street's 3rd Annual Gala" to raise money for people living with lugarics disease. After completing the mosaic I etched the three panels, then I regrouted it in black (to stain the glass) and finally I layered multiple coats of polyurethane to give it a satin finish.